Hilo is the rainiest city in the United States. We get an average of 127 inches of rain per year and on average it rains 275 days per year. The outskirts of our town often receive 200 inches of rain per year. The most rainfall we received in a month was 51 inches. But that is nothing when you consider that we received 27 inches of rain in one day. This little graph shows you the cumulative amount of rain that we have had so far for 2013. It looks like 2013 is shaping up to be another rainy year. Here is a video that shows you what Hilo rain is like. You might think it’s raining hard in this video, but this is what I would consider light rain. Maybe I will post one of my own rain videos in the future that shows just how hard it can rain in Hilo. Here is a music video by Kapena about Hilo rain. I believe that the musicians of Kapena are from Oahu, so they might not have lived through as much rain as we have but I guess our rain is famous enough to have songs written about it. Hilo Weather: What is the weather really like in Hilo? Hilo Weather? Rainy, with a chance of rain. Seriously Hilo is the rainiest city in the entire United States. It even beats Seattle in rainfall. Most of the time we get around a hundred inches of rain per year. In the outskirts of Hilo, rain fall of 180 to 200 inches is not unheard of. That is a lot of Hilo Rain. There are a number of places that you can get forecasts from, but my favorite place to get the weather forecast for Hilo is the National Weather Forecast which is provided by the NOAA. I like it because it provides a detailed forecast and since it is run by the government it has less advertising than the other weather sites. But overall, I happen to think that most weather forecasters exist to make fortune tellers look good. Heck, I can tell you what the weather will be in Hilo with an exceptionally high degree of accuracy–rainy. And if it doesn’t rain today, it will rain tomorrow, you can almost count on it. Hilo is the rainiest city in the U.S. I know, wikipedia says that Hilo is the third wettest city in the U.S., but wet versus rain are two different things. The other two cities are located in Alaska, where it snows for (I don’t know) six months out of the year. Snow may equal wet, but in my book it does not equal rain. Therefore, Hilo is the rainiest city in the U.S. Since all of it’s precipitation falls as rain. At least, I’ve never seen it snow here in Hilo in the decades that I have lived here. Hilo airport receives an average of 126 inches of rain per year, but there are places that are on the outskirts of Hilo town that receive over 200 inches of rain per year. Hilo has an average of 276 rainy days each year. I guess that’s not so bad, we get 89 days that are sunny. Plus a lot of the rain falls at night, so this figure is slightly deceptive. 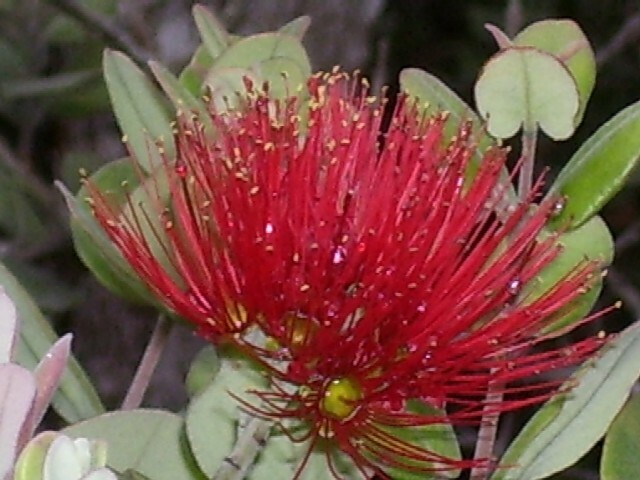 So why do I have a picture of a Lehua flower on this post. Well, legend has it, if you pick a Lehua flower it will start to rain. I guess a lot of people here have been picking Lehua flowers. How hot and how cold does it get in Hilo? Our highest average temperature usually occurs in the month of September and is 83 degrees. This is hot, but not too hot in my opinion, at least in comparison to Las Vegas, which seems to be a favorite destination for many of us Hiloans. While the lowest average temperature is 63 degrees and usually occurs in the month of February. All I can say is brrrrrr, while I shiver just thinking about it.